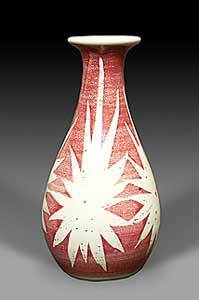 Geoffrey Eastop vase - 6" (152 mm) high. Geoffrey Eastop was born in London in 1921. He studied at Goldsmiths' College in London and the Academie Ranson in Paris. Following a year at the Odney Pottery in Cookham, Berkshire, he and Alan Caiger-Smith set up Aldermaston Pottery. He left Aldermaston after six years to set up his own pottery in Padworth, Berkshire. He has moved twice since then, staying in the same area, and has been at Newbury, Berkshire since 1985. Eastop has used a wide variety of techniques, materials, glazes, styles and sizes - from small pots to large architectural works. His work is exhibited at the Victoria and Albert Museum in London and the Fitzwilliam Museum, Cambridge, and has been shown at many exhibitions around the world.